The State Collection is one of Queensland’s most valuable assets. Generous support from our donors allows the Queensland Museum Network to acquire objects, artefacts and specimens representing Queensland’s natural and cultural heritage. The intricately feathered dhibal SagerauGutatWerr.Torres Strait Islanders celebrate significant events including birth, marriage, and death with traditional ceremonies. These celebrations often include ceremonial costumes, feasting, singing and dancing. 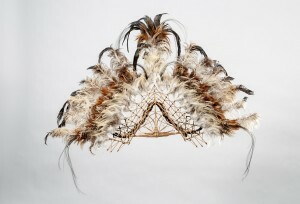 The Waia family Torres Strait Islander Walter Waia (clan name Sagerau Zia) created SagerauGutatWerr a traditional dhibal (headdress) for engagement and marriage ceremonies on his native Sabai Island. In 2012, the Queensland Museum Foundation purchased this intricately feathered dhibal for the State Collection. As well as being incredibly beautiful, this dhibal is significant as it is the only one in the State Collection used in a traditional ceremony. To learn more about Torres Strait Island customs and culture, visit our online exhibition Awakening. 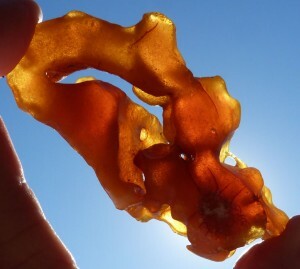 Fossilised amber found along the Cape York coastIn 2003 Australia’s first major amber deposit was located in a remote part of the Cape York coastline. This ancient amber features inclusions of flowers, feathers and insects, providing a rare insight into the flora and fauna of our ancient past. Thanks to generous support from Phil Creaser and the CREATE Fund, and matched by donations from the Queensland Museum Foundation, over the next three years the Queensland Museum Network will purchase pieces of amber for the State Collection. Using high-powered synchrotron x-ray imaging our scientists will identify, describe and photograph the ancient specimens trapped within the amber and compare results with modern species, to learn more about the evolution of one of Queensland's key ancient wilderness areas.